CHICAGO, ILLINOIS (January 30, 2008) More than 50,000 tickets have been sold for the U.S. Men’s National Team’s Feb. 6 clash with rival Mexico at Reliant Stadium in Houston, Texas. With one week remaining before the match and both teams expected to announce their game rosters by Friday, the approximately 18,000 remaining tickets are expected to sell quickly. The last USA vs. Mexico match at Reliant Stadium drew a passionate sellout crowd of 69,582 fans on May 8, 2003 and remains the largest home crowd for the U.S. Men’s National Team this decade. Next Wednesday’s match kicks off at 8 p.m. CT and will be televised live on ESPN2 and Univision. In an arrangement unique for this game, U.S. Soccer has divided the seating into U.S.A., Mexico, and mixed/neutral fan sections at each price level. Tickets as low as $35 are on sale now at ussoccer.com, by phone at 713-629-3700, at all Houston area Ticketmaster ticket centers (including Fiesta stores, Macy’s, Wherehouse Music, FYE, and select HEB stores), and at the Reliant Stadium south ticket office (open Monday-Friday, 10 a.m. to 5 p.m., and Saturday 10 a.m. to 2 p.m.). VIP ticket packages that include a premium pregame party starting at 6 p.m. inside the Houston Texans' training bubble (located across from Reliant Stadium) are also on sale through ussoccer.com and Ticketmaster. Packages priced at $250 each include a lower midfield game ticket, an all-you-can-eat buffet with beer and wine, and pregame entertainment. Four out of the last five USA-Mexico meetings on U.S. soil have been sellouts, including two matches in 2007. Tickets are again in high demand for the 2008 edition of the biggest soccer rivalry on this continent. “Mexico is always a challenging opponent, and we all know this is a game that motivates everyone involved,” said U.S. head coach Bob Bradley. “The first half of 2008 is very important to our team as we prepare for the beginning of World Cup qualifying in June, and the match against Mexico will be an important part of that process. The atmosphere at Reliant Stadium in 2003 was tremendous, and we look forward to another enthusiastic crowd in Houston in February." Both the U.S. and Mexico will begin qualifying for the 2010 FIFA World Cup in June, and the game in Houston will likely be the last meeting of the two CONCACAF powers prior to Final Round Qualifying for the World Cup, should both teams advance out of the preliminary rounds. The U.S. has dominated the series of late, collecting an 8-0-1 home record against Mexico since 2000. During that span, the USA has netted 15 goals, while Mexico has scored just one. In six friendly matches this decade, Mexico has yet to score a goal on U.S. soil. The last meeting between the teams saw Benny Feilhaber’s highlight-reel goal in the 73rd minute give the U.S. a second-straight CONCACAF title with a 2-1 win at the Gold Cup Final at Soldier Field in Chicago on June 24, 2007. HOUSTON, TEXAS (January 31, 2008) The University of Houston swimming and diving team begins its final week of the regular season at 5 p.m., Friday as it travels to College Station to face No. 6 Texas A&M at the Student Rec Natatorium. The Cougars (8-7) will be looking to snap a four-meet losing streak after being swept by No. 24 LSU and Conference USA rival Rice last weekend at the Campus Recreation & Wellness Center Natatorium. At that meet, freshman diver Courtney Forcucci swept both springboard events to lead UH. For her impressive efforts, she was honored earlier this week as the C-USA Diver of the Week, the second time this season she has received the league's weekly award. On the swimming side, a pair of juniors has led the Cougars this season. Sasha Schwendenwein has posted UH season-best times in the 50-, 100-, 200- and 500-yard freestyle events as well as the 200-yard butterfly and the 100-yard backstroke. Andrea Pa'lmai leads UH in the 100- and 200-yard breaststroke and the 200- and 400-yard individual medley. The Budapest, Hungary, native joined Forcucci as the only event winners last weekend after finishing first in the 400-yard individual medley. Following their showdown against the Aggies, the Cougars return home to play host to New Orleans at 11:30 a.m., Saturday at the CRWC Natatorium. Fans should note that Saturday's starting time was recently changed from earlier published schedules. Prior to the UNO, the Cougars will hold a ceremony to honor their 2008 seniors. The meet is free and open to the public, which is invited to attend. HOUSTON, TEXAS (January 31, 2008) The defending MLS Cup champions are looking to add new faces to its already talented group of Dynamo Girls. The Dynamo Girls, which since 2007 have added a new entertainment aspect to the team’s game day experience, will continue to serve as ambassadors for the club in the community. Leading the Girls for the second-straight season will be Marilu Amador Harman, a former dancer for the NBA’s Dallas Mavericks, who directed and created the Houston Rockets Power Dancers. Media is invited to attend the tryouts on Saturday the 16th from 8:00 a.m. to 12:00 p.m.
COLORADO SPRINGS, COLORADO (January 30, 2008) TCU freshman Maria Alvarez was named the Mountain West Conference Women’s Swimmer of the Week, the league office announced on Wednesday. Alvarez won two events to help lead the Horned Frogs past New Mexico last Saturday. competitor, and over three seconds better than the closest Lobo swimmer. dominant performance in the 500-freestyle, winning the event with another season-best time of 5:06.01, which was over seven seconds ahead of the next competitor. the swimming and diving squads. University Recreation Center at 6 p.m.
HOUSTON, TEXAS (January. 30, 2008) The Grand Prix of Houston will open with a bang this year when the three-day festival kicks off on April 25 with “Fiesta Friday Presented by Lowe’s”, a celebration of racing and music spotlighting Houston’s vibrant Hispanic community. The event will feature a concert by Los Super Reyes, one of the hottest names in Latin music, and will be sponsored by Fiesta Mart and Lowe’s. After a day of racing and opening acts featuring top local talent, headlining act Los Super Reyes will bring their energetic sounds to the main stage at JAGFlo Speedway at Reliant Park. Led by veteran composer/producer and keyboardist Cruz Martinez, Los Super Reyes consists largely of former members of the legendary Kumbia Kings, who became international stars after forming in 1999. Martinez and other bandmates first cut their teeth as band members for Selena, the vocalist widely credited with popularizing Tejano music throughout North America. Once that musical pursuit was put to an end by Selena's untimely death, Martinez and A.B. Quintanilla put their heads together to blend popular urban styles with their native Mexican music, creating Los Kumbia Kings. Martinez’ newest creation Los Super Reyes is continuing to perfect the Kumbia Kings’ irresistible blend of traditional Mexican cumbia sounds with urban hip-hop and dance. The 12-member group has enjoyed major chart success with their 2007 recording industry debut “El Regreso de Los Reyes”, and maintains a busy performance schedule in support of the album. The Los Super Reyes concert and Fiesta Friday are made possible by the support of the two major sponsors, Fiesta Mart and Lowe’s, which are providing not only corporate sponsorship but also key promotional support. Fiesta will serve as the event’s title sponsor and will activate the sponsorship in their thirty-two Houston-area locations. Fans will have the opportunity to purchase two-for-one Fiesta Friday tickets at any Houston-area Fiesta Ticketmaster location. Presenting Sponsor Lowe’s will also provide valuable promotional support by leveraging their relationship with Lowe’s Fernandez Racing and driver/owner Adrian Fernandez, one of the most popular Mexican racecar drivers. To promote Fiesta Friday, the Grand Prix has partnered with Univision, the leading Spanish-language media company in the Houston market. Univision will advertise the event across many of their radio and television properties and will provide promotional support across all platforms. Univision radio station KLTN “Esterio Latino” will be the anchor station for the promotional efforts, with popular morning show personality Raul Brindis serving as spokesperson for Fiesta Friday and the Grand Prix’s Spanish-language advertising efforts. DALLAS, TEXAS (January 28, 2008) As more and more former professional players from the North American Soccer League, Major League Soccer, and Major Indoor Soccer League take up coaching positions in US Youth Club Soccer, we see a marked improvement in both the individual player and team performances. It is no coincidence that as the very best US teams are selected to compete in the Dr Pepper Dallas Cup, a high number of those teams are coached by former professional players, who are passing on their soccer knowledge to their young players. Led by former US National team players Tab Ramos and Desmond Armstrong, Dr Pepper Dallas Cup XXIX will certainly be an “old boys’ reunion” with no less than twenty four former professional players with past experience in the US Leagues bringing their youth teams to compete in this years tournament. We welcome so many former players and wish them enjoyment and success in all their efforts on behalf of the sport of soccer. 180 teams from around world will make up the tournament competition in March, ranging in ages 13 to 19. Teams from 17 countries, 25 states will compete one of the most prestigious youth boys’ soccer tournament in the United States. The Super Group (U19) reads like a “Who’s Who” of international soccer with Liverpool FC of England, Sao Paulo of Brazil, Andromeda SC of Texas and Benfica of Portugal to name a few competing in the eight day tournament. HOUSTON, TEXAS (January 29, 2008) University of Houston freshman Courtney Forcucci was named Conference USA Diver of the week on Tuesday. Forcucci was the leading performer in last weekend’s meets, sweeping both events against Rice and No. 24 LSU. The Fort Mill, S.C., native won the 3-meter springboard, finishing nearly 40 points ahead of her competitor, with a season best of 332.03 points. Her second win came during the 1-meter competition with 293.85 points, finishing more than 13 points ahead of the second-place competitor. This was Forcucci’s second weekly honor for the 2007-08 season. She was first honored on Nov. 6, 2007. The Cougar Swimming and Diving team will wrap up the regular season at 5 p.m., Friday, at No. 6 Texas A&M. The Cougars return home to play host to New Orleans at 11:30 a.m., Saturday at the Campus Recreation & Wellness Center Natatorium. Fans should note that Saturday’s meet time was recently changed from earlier published schedules. Following more than a three-week break UH will play host to the 2008 Conference USA Championship and Invitational. It begins Feb. 27 and runs through March 1 at the CRWC Natatorium. Other teams participating in the Championship are defending champion SMU, Rice, East Carolina, Marshall, Cal State Bakersfield, and Northern Colorado. TEXARKANA, TEXAS (January 28, 2008) More than half a century after professional baseball left the area, the Continental Baseball League announced today that it is adding a franchise in Texarkana for the upcoming 2008 season, said Ron Baron, CBL president and CEO. Tickets to CBL games average $7, parking is free and concession stand items are priced well below the going rate at major league and other pro baseball venues. The Twin Cities -- Texarkana, Texas and Texarkana, Arkansas -- fielded an original Texas League team in 1902, and are the hometown of major league Hall of Fame third baseman Eddie Mathews, who starred for the Boston, Milwaukee and Atlanta Braves. Although the area has been a hotbed of amateur baseball, the last pro team to play in town was the Texarkana Bears, which won Big State League championships in 1947 and 1950, but folded in 1953. The cities also count politician Ross Perot among its many distinguished citizens. The CBL will be starting its second season of play in 2008 after fielding four teams in 2007. The inaugural season was a success despite the heavy amount of rain in the Texas market. The Tarrant County Blue Thunder, managed by former Texas Rangers infielder Curtis Wilkerson, won the first league title, beating the Bay Area Toros of Texas City this past August. The tournament trophy was named after Hall of Fame pitcher Ferguson Jenkins, and this trophy will be presented annually to the winner. The Texarkana franchise, which will be given its official team name in the next few weeks, will be headed by Professor Frank Snyder, a former Washington, D.C. lawyer who now teaches at the Texas Wesleyan Law School in Fort Worth. Snyder, 54, is the principal owner and president of TXAR Professional Baseball LLC. Snyder also announced today the hiring of the team’s general manager, David Farren, 26, who is no stranger to baseball fans in the community. Farren became a local diamond legend during his days at Texas High and later played in the Baltimore Orioles organization. “This is great news! Texarkana is indeed a baseball town. It will be very exciting for Texarkana to field a professional-level baseball team after a 54-year absence. The Texarkana Bears were popular with our community, and I think a Continental Baseball League team can catch on and be successful in Texarkana,” said Mayor Horace G. Shipp, Texarkana, Arkansas. The Texarkana franchise will play its first season at George Dobson Field. The field presently seats 600 and plans are to add bleachers to increase capacity to about 1,600. Single game/season ticket packages, along with information about group outings, sponsorship and advertising opportunities will be announced in the very near future, said Snyder. Tryouts for the team will take place in the spring, with an emphasis on attracting several solid local players. Snyder said he and Farren will be announcing the name of the team’s field manager and coaching staff, along with other front office personnel, in the next few weeks. The pair will be attending the annual Baseball Winter Meetings in Nashville, December 3-6. Snyder also announced a “Name The Team” contest for fans, and entries can be submitted on the team website (www.texarkanaprobaseball.com). CORPUS CHRISTI, TEXAS (January 29, 2008) There’s a whole new brand of pro baseball coming to the area beginning next Memorial Day. The Continental Baseball League announced today it is adding Nueces County as a new franchise for the upcoming independent league season that begins Memorial Day weekend in May. Ron Baron, the league CEO and president, will head up a group of North Texas businessman as owners of the Nueces County franchise (to be officially named at a later date) with a goal of bringing “family-affordable entertainment, with a focus on youth baseball” to Fairgrounds Field. The CBL will play a 72-game regular season schedule this coming season. It enters its second season with franchises in three other Texas cities—these include Texarkana (nickname to be announced soon), the Bay Area Toros of Texas City, TX, and the MetroPlex Blue Thunder, which played last season in Tarrant County in the Dallas-Fort Worth market. The CBL is headquartered in Addison, TX. and has former major league outfielder Jay Johnstone and Bob Ibach, a former Chicago Cubs executive, on its league staff. Last season, the Tarrant County Blue Thunder, managed by former Texas Rangers player Curtis Wilkerson, won the inaugural Ferguson Jenkins CBL Championship, named after the Hall of Fame pitcher and former Texas Ranger Cy Young Award winner. Texarkana was recently added to the league in December, returning professional baseball to that market for the first time since 1954. Baron indicated the league is presently exploring additional franchise opportunities in other Texas, Louisiana and Oklahoma markets and hopes to add two more franchises, either for the 2008 season or by 2009. Last year, Baron operated a traveling team in the league, the Texas Heat, which played in the four-team league and made the playoffs. That team will not return for the 2008 season. Players for the Nueces County team will consist of a combination of free agents, former CBL players and several talented players from the Corpus Christi area. An announcement on team tryouts, as well as ticket plans and front office personnel, will be made in future weeks. Baron is very supportive of bringing a community, fan-friendly product to Nueces County for the coming season, one that will feature 36 home games during a season that goes through mid-August, followed by league playoffs. “One of the reasons I got involved with the CBL was to bring affordable baseball to families, with an emphasis on creating a fun time at the ballpark for youngsters of all ages,” noted Baron. “Ticket prices at the major league level have climbed dramatically, whereas it costs more than $300 sometimes for a family of four to attend a game. “As part of our plans for the coming season here in the Corpus Christi area, we will hold post-game, on-field clinics for kids, giving them a chance to meet their heroes face-to-face and at the same time learn first-hand about the skills it takes to play the game. What great memories this will create for them! We also want to do other things that will recognize both youth and family, such as having the first 200 youngsters in attendance go on the field before the game to join in with the singing of the national anthem, right along side of the players. Pitcher Matt Sartor of the Lewisville Lizards was signed by the Los Angeles Dodgers, the first CBL player to jump to the next level, and Ibach said “there will be a lot more to follow as folks become more aware of the talent in our league.” Ibach’s son, Kevin, is the Midwest Area scout for the Florida Marlins after spending seven years with the Baltimore Orioles organization. COLLEGE STATION, TEXAS (October 27, 2008) TCU’s run came to an end Monday at the Wilson/ITA South Central Regional Men’s Tennis Championships. The lone Frog doubles tandem remaining in the main draw fell in the semifinal round, while two other TCU players concluded action in the consolation round of singles play. Junior Adrian Simon and sophomore Emmanuel Brighiu were eliminated in the semifinals of the main doubles draw after suffering an 8-4 loss to Texas’ grouping of Dimitar Kutrovsky and Joshua Zavala. Simon and Brighiu had won three straight matches to reach Monday’s semifinal. In singles play, Simon swept three consecutive Monday matches, including one against Frog teammate Zach Nichols, to take the Round 2 consolation title. After an easy 6-1, 6-3 quarterfinal victory over Louisiana Lafayette’s Yanick Mandl, Simon outlasted Nichols, 1-6, 6-3 (8-9), when Nichols elected to retire. Nichols reached the semifinal with a walkover win over Rice’s Chong Wang. Pulgar Garcia (Louisiana Lafayette), who was injured. when it travels to Austin, Texas, for the Texas Invitational. COLORADO SPRINGS, COLORADO (January 27, 2008) Anees Hasnain, of McKinney, Texas and Chris Martinez of Sugar Land, Texas fought their way into the April 5th Olympic Trials Finals by winning their respective divisions on Saturday at the USA Taekwondo Olympic Trials Fight-Off in Colorado Springs on Saturday. The 16-year old Hasnain captured the women's flyweight division and 24-year-old Martinez won the men's featherweight class. Hasnain, who was undefeated in three fights, won his first round match 6-4 by defeating Mara Perscheid of Alexandria, Virginia. 6-4. Next she defeated Alexis Martinez (Pembroke Pines, Florida) by the score of 7-4. She again beat Martinez beat Perscheid in the elimination bracket, 5-4, to set up a rematch with Hasnain in the finals. Hasnain defeated her again, 4-3 to win the division. Hasnain will now move on to the Olympic Trials Finals on April 5 in Des Moines, Iowa on April 5. There she will face top-seeded Charlotte Craig of Murrieta, California. Hasnain must defeat Craig twice in Des Moines, where a single win by Craig will deny Hasnain a bid to Beijing. Chris Martinez also went undefeated on the day, winning four matches to secure his play in the finals. He scored a 5-2 win over Richard Lee of Granada Hills, California, a 3-2 victory over James Moontasri of Colorado Springs, Colorado. He next defeated David Bartlett of Colorado Springs, Colorado with a 1-0 overtime win and then scored another win over Bartlett in the finals by the score of 3-2. Martinez will now face fellow Texan and 2005 World Champions Mark Lopez of Sugar Land the Olympic Trials Finals in Des Moines. Martinez must defeat Lopez twice to secure a spot on the Olympic Team. As I strolled into the hotel, I did not know what I was getting into. Being there in dual role of photographer and writer was new for me. Usually I shoot the required photos, retire to a quiet corner to edit them and e-mail said photos to the appropriate person. After that, I am done and can relax until the next assignment. Let the writers write I always say. After I get the photos, I am done. Today I was in for a new experience. As I walked into the crowded banquet room at the Westin Oaks where the draft party was held, I was struck by the overall excitement and anticipation that filled the room. As I arrived, Team Texas had already selected 2001 Heisman Trophy winner Eric Crouch as their first round pick. Crouch played quarterback for Nebraska, a role he would continue with Texas. Previously, he played professionally for the Toronto Argonauts of the CFL and the Hamburg Sea Devils of NFL Europe. As I milled around the room I did what most people would do in an unfamiliar situation, I headed for the free food at the buffet bar. Knowing that athletes at any level are serious eaters, I felt I could strike up a conversation with someone who might have something interesting to say. I do not do interviews. I am a photographer. Writers write and photographers shoot pictures. Never the two shall meet, at least not in my book. Well, not today at least. I am in for the entire game, so I had better make the best of it. I am glad my instincts drew me to the food. Good things always happen over food. After I appropriated a plate full of nachos, a favorite of any serious journalist, I sat down at a table that was occupied by a single young man. I introduced myself and asked him who he was and how he was doing. He smiled and said he was doing great. He added that he was recently been drafted by Texas and introduced himself as Eric Buchannan. Buchannan, who played safety for TCU in college, is currently working for the US Postal Service. As I sat and listened to him, I got the distinct impression that he was very grateful for the opportunity to play professional football. Here was a man who completed his college eligibility, graduated from said college, and entered the workforce. Who would have guessed he would be given a chance to fulfill his dream of playing professional football? Very few people, I imagine. I listened a bit more, thanked him for the interview and excused myself. I looked around the room for a new table at which to sit. Yes, I took my nachos with me. They were a reason to sit and start conservation. As I circulated around the room, I knew I had happened onto something special. I was witnessing something that does not come around very often. That something is people who are given a chance to see their dreams come true. I talked to Rolando Humphrey, who played cornerback for SMU. He had also been selected for the protected list by Texas. He now owns a paint and body shop in north Dallas and was accompanied by his girlfriend. She is in her last year of college at SMU and will graduate in May. They both seemed just as excited as Buchannan did with this chance to continue playing the game he loves so much. As time went on, Texas announced more of their picks. In the second round, Texas had the 10th overall pick, selecting Freddie McCutcheon (defensive tackle-San Jose State). Their third pick (15th overall) was Aaron Cotteral (defensive tackle/linebacker-Lenoir Rhine/South Carolina). As each new member of Texas was announced, family members cheered and screamed with excitement. It was reminiscent of the numerous draft shows I have witnessed on television. Each family member showed the pride and exuberance of a dream come true. Their son, brother, cousin, or friend was having their dream and desires fulfilled also. To see a loved one given chance at greatness is a think to behold. Professional sports have become so typical as of late. Money, money, money! That is what professional sports is all about currently. However, that is not what I saw here. The players seemed not to be excited about the money they were going to make or the fame they may receive. They were excited to be back in the game they loved. They were excited to have the chance to line up across from each other and play the game they grew with. .In essence, they were very grateful for one more chance. I later talked to William Blaylock (offense lineman, Baylor) who is currently coaching at West Texas A&M University. He was also selected for the protected list and told me if this works out, he would not be coaching next year. I could tell that he hoped he would be able to call West Texas A&M and give them the sad news would not be retuning to Canyon, Texas to coach this fall. I can only imagine how these players and their families feel about this opportunity. As a photographer, I have always felt that one can cover an event but never really be a part of it. My feelings today were very strange. I am so used to coming into an event, looking for best shot and leaving; never really getting into the full experience that is the event. I did not feel that way today. The room was filled with celebration. It was a very joyous occasion. Family member and friends were truly excited for their players. I felt the same way. I felt happy for every one of these young men and hope they achieve their dream. As I think about this assignment, I feel I really was part of it. Every person was excited and proud that I wanted to talk to him or her, to hear their stories, and feel their pride. If there has been a sofa, an overstuffed chair and my dog lying at my feet, I could not have been any more at home. HOUSTON, TEXAS (January 26, 2008) For the second straight day, University of Houston freshman Courtney Forcucci claimed top honors in a diving event to lead the Cougar Swimming & Diving team during the final day of a tri-meet against No. 24 LSU and Conference USA rival Rice on Friday at the Campus Recreation & Wellness Center Natatorium. Forcucci scored 293.85 points on the 1-meter springboard to finish more than 13 points ahead of her closest competitor. The Fort Mill, S.C., native was the only diver to record at least 293.00 points in both events after winning the 3-meter competition Friday evening. Teammates Ginni van Katwijk and Lacey Truelove finished third and fourth, respectively, to lead the Cougars. Junior Andrea Pa’lmai led the Cougar swimmers after winning the 400-yard individual medley during the final individual event of the day. The Budapest, Hungary, native finished more than four seconds ahead of her closest competitor. The Cougars dropped both meets to their rivals, falling 240-102 to the 24th-ranked Tigers and 225-117 to Rice. LSU swept the two-day meet with a 240-102 win over Rice. With the losses, the Cougars lost their fourth straight and fell to 8-7 overall in dual meets this season. The Cougars return to action next weekend with their final two meets of the regular season. UH faces No. 6 Texas A&M at 5 p.m., Friday at the Student Rec Center Natatorium. From there, the team wraps up the regular season when it plays host to New Orleans at 11:30 a.m., Saturday at the Campus Recreation & Wellness Center Natatorium. Fans should note that Saturday’s starting time was recently changed from earlier published schedules. HOUSTON, TEXAS (January 25, 2008) University of Houston freshman Courtney Forcucci won the 3-meter diving competition to lead the Cougar Swimming & Diving team during the first day of a tri-meet against LSU and Conference USA rival Rice on Friday at the Campus Recreation & Wellness Center Natatorium. Forcucci posted added 332.03 points in the 3-meter competition to lead the Cougars to a sweep of the Top Two places in that event. She was the only diver to crack 300 points. LSU held a 143-40 lead over the Cougars, while Rice enjoyed a 121-58 advantage after the first day. LSU also held a 125-54 lead over Rice. On the swimming side, junior Sasha Schwendenwein finished third in the 200-yard freestyle with a clocking of 1:53.04, while fellow junior Andrea Pa’lmai earned a similar place in the 200-yard individual medley with a time of 2:07.28. The meet wraps up at 11:30 a.m., Saturday with the 400-yard medley relay, 500-yard freestyle, 200-yard butterfly, 200-yard backstroke, 100-yard breaststroke, 1-meter diving, 100-yard freestyle, 400-yard individual medley and 200-yard freestyle relay. HOUSTON, TEXAS (January 24, 2008) ­The University of Houston swimming and diving team competes in Houston for the first time in three months this weekend when it plays host to LSU and Conference USA rival Rice in a two-day tri-meet at the Campus Recreation & Wellness Center Natatorium. The meet begins at 5 p.m., Friday with the 200-yard medley relay, 1,000-yard freestyle, 100-yard butterfly, 100-yard backstroke, 200-yard breaststroke, 200-yard freestyle, 3-meter diving, 50-yard freestyle, 200-yard individual medley and 400-yard freestyle relay. Fans should note that Saturday's starting time recently was changed from earlier published schedules. All UH swimming and diving meet are free and open to the public, which is invited to attend. Although the Cougar divers competed at their own Houston Invitational on Nov. 15-17, this will be the first time that the swimmers and divers have performed together since Oct. 26-27 at the Phill Hansel Duals Weekend. The Cougars (8-5) come into the meet after dropping a pair of dual meets last weekend in north Texas. UH looks to return to its winning ways after falling 133-110 at North Texas and 140-91 at No. 12 SMU. This season, junior Sasha Schwendenwein has emerged as one of the team's steadiest performers. The Randburg, South Africa, native has posted the Cougars' best times in the 50-, 100-, 200- and 500-yard freestyle events. Fellow junior Andrea Pa'lmai tops all UH swimmers in the 1,000- and 1,650-yard freestyle events as well as the 200-yard backstroke and the 100-and 200-yard breaststroke events. Freshman Andrea Kells, competing in her first collegiate season, leads the Cougars in both the 100- and 200-yard butterfly events. On the diving side, senior captain Ginni van Katwijk had led the Cougars on the 1-meter springboard and platform and comes into this weekend's meet as the defending C-USA Diver of the Week. Freshmen Courtney Forcucci and Lacey Truelove also have been consistent performers in all three diving events this season and are scheduled to be in action this weekend. AUSTIN, TEXAS (January 24, 2008) The AT&T Austin Marathon is launching a new philanthropy program called 26 Miles for 26 Charities, an initiative that partners the 26.2-mile race with selected nonprofits to help elevate awareness and raise money while filling critical volunteer roles throughout the marathon and half marathon courses. Participating nonprofits will volunteer at designated water stops and clothing drops throughout the race route and are encouraged to develop a theme at their station to create an exciting atmosphere for the thousands of athletes passing by. This allows the nonprofits to highlight their organization while creatinga fun and uniquely Austin experience for the runner. In exchange, the race provides these organizations with a number of fundraising tools and opportunities to raise awareness. Organizers estimate the nonprofits can raise around $100,000 each, though every organization has unlimited potential to leverage this opportunity and raise even more. The collective fundraising goal for this inaugural year is $2.6 million, compared with an average of approximately $1 million raised for charities in previous years. Directors of 26 Miles for 26 Charities (26 for 26) expect the nonprofits can meet the ambitious goal while providing essential services for the runners. “Through 26 for 26, the race and the nonprofits come together in a way that benefits both groups,” 26 Miles for 26 Charities Co-Director Ainsley Williams said. A total of 31 charities were selected, five more than are mentioned in the program’s name, to accommodate additional half marathon water stops. Nonprofits in all sectors are capitalizing on this opportunity to reach new audiences. Communities in Schools - Central Texas, Inc.
MYRTLE BEACH, SC (January 23, 2008) The United States Bowling Congress Board of Directors has given approval to start negotiations with all parties involved to relocate the organization's headquarters to Arlington, Texas. The decision, made Sunday during the Board's meeting in Myrtle Beach, S.C., is contingent on negotiations for buildings and land near the Bowling Proprietors’ Association of America complex along with any incentives offered by the City of Arlington and State of Texas. The BPAA Board of Directors also must approve the plan which it is scheduled to do at a meeting Wednesday during the BPAA Mid-Winter Meetings in Myrtle Beach. "After carefully considering the facts, including taking into account the long history of USBC and its predecessors in the Milwaukee area, the Board came to the conclusion that it was in USBC's best business interests to join with BPAA in Arlington creating an international bowling campus," said USBC President Jeff Bojé. USBC Headquarters will move to Arlington unless there is a breakdown in the negotiations relating to the property. If all details can be worked out, USBC is expected to move its headquarters operations within a year. In addition to office space for approximately 235 overall employees, the new complex would include a combined equipment testing and international training center. "The property we are looking at is in a very high profile area that we believe will help enhance the visibility of the sport of bowling," Bojé added. "In addition to being close to Six Flags, the Texas Rangers baseball stadium and new Dallas Cowboys football stadium are close by. There also are a number of other entertainment venues in the vicinity. "With USBC and BPAA under the same roof, there's an untold number of ways we can work together to help grow the sport," Bojé said. "There already are a number of joint programs that we work together on and this proposal would allow us to do so even more." USBC and BPAA announced in November their boards of directors had approved study of how much their operations should be integrated. The goal was to use such efficiencies to help grow the sport of bowling. IRVING, TEXAS (January 23, 2008) Houston’s Ginni van Katwijk is the Conference USA Diver of the Week. van Katwijk was the Cougars’ leading diver during a road swing through north Texas as she swept both events at North Texas and earned second- and fourth-place finishes at No. 12 SMU. Rice’s Brittany Massengale is the Swimmer of the Week after winning three individual events and swimming as a member of a winning relay as the Owls defeated North Texas. van Katwijk was the Cougars’ leading diver during a road swing through north Texas last weekend. The senior swept both events at North Texas and earned second- and fourth-place finishes at No. 12 SMU. van Katwijk won the 1-meter event with 262.73 points against UNT and finished first on the 3-meter board with 273.08 points. Her efforts helped lead the Cougars to a sweep of the Top Three places in both events. Massengale won three individual events and swam as a member of a winning relay as the Owls defeated the University of North Texas in a dual meet Saturday in Denton. Massengale had an impressive accomplishment with back-to-back victories. The Alma, Ark., native won the rugged 1,000-yard freestyle and then came back and won the very next event, the 200-yard freestyle. She then led a 1-2 Rice finish in the 500-freestyle and swam the third leg of the Owls' winning 400-free relay. The weekly award is the fifth of Massengale’s career, her second in 2007-08 (Oct. 16). ATLANTA, GEORGIA (Janaury 22, 2008) The All American Football League (AAFL) announced today that they have finalized a corporate sponsorship deal with Schutt Sports. Schutt will provide the new professional football league with helmets, shoulder pads and other protective equipment, as well as training aids, gear and reconditioning services for the League's six teams. Schutt Sports will also be the title sponsor of the AAFL Schutt Offensive Player of the Week and Player of the Year Awards. "2008 is going to see a lot of great new things on the football field, including new products from Schutt and the birth of this brand new professional football league," said Dave Rossi, Chief Marketing Officer of Schutt Sports. "We're excited about partnering with the AAFL and fully support their vision and enthusiasm for the league and its players. The AAFL is an ideal place to showcase all of our new products that continue to make Schutt Sports the world's #1 brand of football helmets and faceguards." Schutt Sports has the only line of football helmets that feature Thermoplastic Urethane Cushioning? (TPU) -- proven superior to traditional foam padding. Three of the four helmets in the Schutt Varsity Helmet lineup feature TPU cushioning. New products from Schutt Sports include the ION 4D and AiR XP helmets, and the AiR Flex Shoulder Pads will be featured prominently in the AAFL. These new products represent the cutting edge of protective equipment for football players. Additional information about new Schutt products can be found at www.schuttsports.com. "We view our partnership with Schutt Sports as a vital element in the development of our League," said Keenan Davis, VP of League Operations & COO of the AAFL. "The safety of our players is of paramount importance. With Schutt providing their most state-of-the-art football padding, helmets, and protective equipment, we are confident that our players will have the protection and comfort that they demand." AAFL teams will play 10 games, beginning in April 2008. The spring schedule is designed to satisfy fans who hunger for quality football between the NFL and college seasons. The League's teams are located in avid college football markets representing Alabama, Arkansas, Florida, Michigan, Tennessee and Texas. HOUSTON, TEXAS (January 21, 2008) The first official event of 2008 for the Texas team of the All America Football League will occur Saturday, January 26 at the Westin Oaks Hotel (Galleria) in Houston. Fans are invited to the 2008 Player Draft Party from 11:00 am to 1:00 pm. The event is free and the public will be able to meet players, and coaches, in addition to watching the draft live. Texas will introduce its protected players whom have been invited to training camp in Houston. Texas will also make its draft picks before a life audience for national television. On October 24-25, 2007, Texas held tryouts at Rice University to evaluate talent. More than 600 players took part for a chance to take to the gridiron for the AAFL. Former Texas based college players that participated include James Brown (QB-Texas), Phillip Geiggar (DB-Texas), Jackie Battle (RB-Houston), Preston Hartfield (RB-Texas Tech), Chad Stevens (TE-Texas), Johnny Mack (RB-Texas Tech) and Marcus Jasmin (DL-Texas A&M). Texas kicks off the 2008 season against Arkansas. All Texas home games will be played at Rice Stadium on the campus of Rice University. HOUSTON, TEXAS (January 20, 2008) The Astros avoided arbitration with third baseman Ty Wigginton by signing him to a one-year contract worth $4.35 million, plus incentives, on Friday. The club also exchanged salary figures with their four remaining arbitration-eligible players. Right-hander Dave Borkowski is asking for $1.1 million and the club is offering $750,000, with a midway point of $925,000. Borkowski earned $575,000 in 2007. Right-hander Geoff Geary is asking for $1.25 million, and the Astros are countering with $950,000. The midway point is $1.1 million. The reliever earned $837,500 last year. Veteran infielder Mark Loretta is asking for $4.9 million, while the club is offering $2.75 million. The midway point is $3.825 million. Loretta earned $2.5 million after signing as a free agent last year. Closer Jose Valverde is asking for $6.2 million, with the Astros countering with $4.7 million. The midway point is $5.45 million. Valverde earned $2 million in his first year of arbitration with the D-backs last year. The Astros will negotiate with the remaining unsigned players in an attempt to find an acceptable middle ground, but in the event they cannot reach an agreement, they'll head to each player's arbitration hearing to strike a deal. Hearings will be held from Feb. 1-20. The Astros have not had an arbitration hearing with a player since they won their case with Darryl Kile in 1997. General manager Ed Wade, however, said he went to arbitration seven or eight times while he was with the Phillies, and he's not ruling out having to attend hearings this year if need be. "It's always the desire to [avoid arbitration hearings], but we certainly wouldn't do anything that we thought was imprudent just to avoid the process," he said. SAN DIEGO, CALIFORNIA (January 20, 2008) Mexico and the United States faced off against each other in San Diego in The Battle Across the Border at San Diego Arena. The lone boxer from Texas fought well, but it was not enough to win in his first fight of 2008 leading up to Beijing. Light flyweight Luis Yanez (Duncanville, Texas) opened the night’s competition with a bout against Mexico’s Odlion Zaleta. 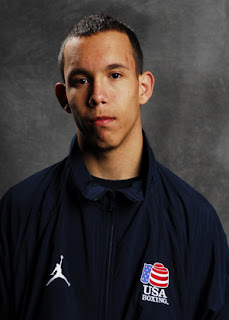 Yanez, who is a 2008 Olympian, took the early lead in the contest, but Zaleta answered back late in the round with a strong shot and the first round ended with Yanez holding a 5-1 lead. Zaleta enjoyed a productive second round, pulling the bout within one point at 8-7 at the halfway mark. He made up his slim deficit in the third as both boxers enjoyed spurts of action and the bout moved into the final two minutes deadlocked at ten. Zaleta pulled out the victory in the fourth round, scoring three points to win a 13-11 final decision and give Mexico the first bout of the event. Three U.S. boxers took home victories in Friday’s action. Welterweight Greg Carter (Waterbury, Connecticut/New Mexico University) earned the first U.S. victory of the night with a 24-13 decision over Oscar Molina of Mexico. Molina held a slim one-point lead at the end of the first round, but it was the last advantage he would enjoy. Despite having a point taken in the second round, Carter took an 11-10 lead at the midway point of the contest. He extended his lead over the final four minutes, taking a 15-10 edge into the final round of boxing. Carter blew it open in the fourth round on his way to a 24-13 final decision. Heavyweight David Carey (Anchorage, Alaska) simply would not be denied in his bout with Mexico’s Javier Torres. Carey took a slim early lead in the bout, holding a one-point advantage after each of the first two rounds. He began to take over the contest in the third round, and enjoyed an 18-12 edge as the final round began. Yet Carey refused to sit on his lead, he turned up the heat, throwing strong combinations and giving Torres a standing eight count. Carey’s efforts earned him nine points in the final round as well as a 27-16 final decision. Super heavyweight Mike Wilson (Central Point, Oregon) closed the show in victorious fashion, winning a 16-9 decision over Mexico’s Andres Ruiz. Wilson led from bell-to-bell in the four round contest; moving out to a 4-1 lead after one. He pushed his lead to a 9-4 margin at the midway mark of the bout, and refused to relinquish his advantage over the final four minutes. Wilson took an 11-7 lead into the fourth round and extended his edge in the last round to take the final victory and end the night on a winning note. HOUSTON, TEXAS (January 19, 2008) Lead by Utah State receiver Kevin Robinson, the West defeated the East 31-13 in the 83rd East-West Shrine Game at Robertson Stadium in Houston. Displaying his talent before 15,328 fans and numerous NFL scouts, Robinson showed he is a versatile athlete by scoring a touchdown and returned a punt for another score. Robinson scored his first touchdown with 49 seconds left in the first quarter. In addition, he returned a punt of 72 yards for his second score. He weaved his way around the East’s line of defense and outran East punter Brett Kern (Toledo) to find the endzone. He celebrated the score by flipping into the end zone, as the crowd showed their support with loud cheers. His first touchdown came with 11 minutes left in the game on a 6-yard pass from quarterback Josh Johnson (San Diego). While at Utah State, Robinson broke the NCAA record for career all-purpose yards per play. He averaged 16.16 yards on 6,479 yards and 401 career plays. University of Houston standout Anthony Alridge helped in the scoring; finding the end zone on a 4-yard run in the 3rd quarter to take the score to 17-3. Aldridge finished the game with two receptions for 39 yards. With 30 seconds left in the game, the West’s Alvin Bowen (Iowa State) found himself in the right place at the right time. Bowen snagged an errant pass by East quarterback Paul Smith (Tulsa), returning it 20-yards for the final touchdown of the game. West kicker Garrett Hartley (Oklahoma) added to the scoring with a 23-yard field goal to end the first half. He also tallied four conversions. The East scoring was limited to a two field goals by Taylor Mehlhaff (Wisconsin). The first came with 4:07 in the 1st quarter and the second at 13:44 in the 4th quarter. Cory Boyd (South Carolina) scored the East’s lone touchdown on a 5-yard run with 4:18 left in the game. Mehlhaff added the conversion to close out the East scoring. Johnson was honored at the game’s conclusion with the William M. Coffman Award as the Offensive Most Valuable Player. He finished the night 5 of 11 passing for 78 yards, 91 yards rushing, with one touchdown. The E. Jack Spaulding Award was given to Arizona linebacker Spencer Lawson as the Defensive MVP. Lawson had one solo tackle and six assists. This is the third year the game has been played in Texas. It was held at Reliant Stadium last year and in San Antonio in 2006. 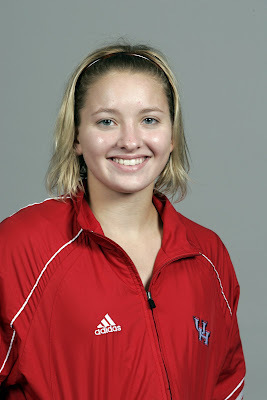 DALLAS, TEXAS (January 19, 2008) University of Houston freshman diver Courtney Forcucci scored 270.45 points on the 1-meter springboard to lead the Cougars during a 140-91 loss at No. 12 SMU on Saturday afternoon at Perkins Natatorium. Forcucci grabbed top honors in a close race that saw less than five points separate the four competitors. Senior captain Ginni van Katwijk was a close second with 269.69 points. The Cougars' 200-yard freestyle relay team of Sasha Schwendenwein, Brittany Copeland, Doreen Polotzek and Lindsey Graves capped the day with a first-place finish after posting a time of 1:40.38. Junior Sasha Schwendenwein finished second in both the 100- and 200-yard freestyle events, while freshman Andrea Kells captured second place in the 200-yard butterfly and the 200-yard breaststroke. Freshman Lindsey Graves (1,000-yard freestyle), junior Andrea Pa'lmai (400-yard individual medley) and freshman Lacey Truelove (3-meter diving) also recorded second-place finishes to lead the Cougars. The Cougars return to action next weekend when they play host to LSU and C-USA rival Rice during a two-day meet at the Campus Recreation & Wellness Natatorium. That meet begins at 5 p.m., Friday and wraps up at 11 a.m., Saturday. View the complete and final results here. DENTON, TEXAS (January 18, 2008) Junior swimmers Andrea Pa'lmai and Sasha Schwendenwein and senior diving captain Ginni van Katwijk each won multiple events, but it would not be quite enough as North Texas claimed a 133-110 win over the University of Houston swimming and diving team Friday afternoon at the Pohl Recreation Center Natatorium. Although the Cougars won the majority of the individual swimming events and swept the Top Three places in both diving events, the Mean Green began and capped the meet with relay wins to enjoy its first win against UH. With the loss, the Cougars fell to 8-4 overall in dual meets this season. The Cougars also saw their 13-meet winning streak against the Mean Green come to an end. Pa'lmai won the 1,00-yard freestyle with a time of 10:30.88 and added a similar finish in the 200-yard individual medley after posting a time of 2:08.22. The Budapest, Hungary, native capped her day with a first-place showing in the 500-yard freestyle after recording a time of 5:06.00. Schwendenwein finished first in the 200-yard freestyle with a clocking of 1:51.93. The Randburg, South Africa, native also won the 100-yard freestyle event with a time of 52.32.
van Katwijk led a Cougar sweep of the Top Three places in both diving events. The Grootebroek, Netherlands, native won the 1-meter event with 262.73 points and scored 273.08 points on the 3-meter springboard to grab top honors. Freshman Andrea Kells grabbed top honors in the 100-yard butterfly with a time of 58.64. Freshman Courtney Forcucci finished second in the 1-meter event with fellow freshman Lacey Truelove placing second on the 3-meter board. The Cougars wrap up their stay in north Texas when they face No. 12 SMU at 1 p.m., at Perkins Natatorium. HONOLULU, HAWAII (January 18, 2008) The University of Houston swimming team capped its winter training with an impressive sweep of Stony Brook, Puget Sound and St. Cloud State on Wednesday at the Duke Kahanamoku Aquatics Center. Competing in a variety of relay events only, the Cougars, who improved to 8-3 overall this season in dual meets, enjoyed 41-13 wins over both Stony Brook and Puget Sound and a 28-26 thriller over St. Cloud State. The Cougars finished first or second in five of the six events in which they competed to take the wins. The team of Andrea Pa'lmai, Doreen Polotzek, Andrea Kells and Sasha Schwendenwein started the meet on a high note, winning the 400-yard medley relay event with a time of 4:04.44, nearly six seconds faster than its closest competitor. After second-place finishes in the 150-yard freestyle and the 150-yard butterfly relays, the team of Schwendenwein, Pa'lmai and freshman Paige Bissett claimed top honors in the 150-yard backstroke with a clocking of 1:23.91, nearly five seconds ahead of the closest competition. The Cougars finished third in the 150-yard breaststroke relay before the team of Schwendenwein, Pa'lmai, Bissett and freshman Brittany Copeland finished first in the 500-yard freestyle relay with a time of 4:42.69, more than nine seconds ahead of their closest competitor. Schwendwein was a member of three first-place teams, while Pa'lmai and Bissett were a part of two winning teams. The Cougars were originally slated to compete on Dec. 31 in the relay meet and on Jan. 4 against an opponent to be determined but unforeseen circumstances forced the cancellation of those meets. The Cougars return to action during this weekend with a trip to the Dallas area. The weekend starts at 4 p.m., January 18 when the Cougars face North Texas in Denton. From there, the team wraps up its stay in North Texas at 1 p.m., January 19, at No. 12 SMU. BEAUMONT, TEXAS (January 18, 2008) Ernie Holmes, a key member of Pittsburgh Steelers’ defense in the 1970s, was killed on Thursday when his car went off a Texas highway and rolled over several times. Police stated Holmes, 59, who played alongside Mean Joe Greene, L.C. Greenwood, Jack Ham, Jack Lambert, Andy Russell and Dwight White was not wearing a seat belt and was thrown from the vehicle. He was pronounced dead at the scene about 20 miles north of Beaumont in southeastern Texas. Holmes was a two-time All Pro drafted by the Steelers in 1971 after playing at Texas Southern. He played 81 games for the Steelers from 1972 through 1977 and finished his career with the New England Patriots. Holmes, who attended Texas Southern University in Houston, was an ordained minister living on a ranch near Wiergate, Texas at the time of his death. "Ernie was one of the toughest players to ever wear a Steelers uniform," club chairman Dan Rooney said in a statement. "He will be missed by the entire Steelers family." HOUSTON, TEXAS (January 17, 2008) The rosters for the East-West Shrine Game officially were released recently and the annual all-star classic is highlighted by University of Houston running back Anthony Alridge, and LSU quarterback Matt Flynn, who was the Offensive MVP of the BCS Championship game earlier this month. A Second Team, All-Conference USA selection from Denton, Texas, Alridge helped lead the Cougars to their third straight bowl game as he rushed for a career-high 1,597 yards and 14 touchdowns. Alridge is slated to take play for the West Team in the game. As for Flynn, the Tyler, Texas native led the Tigers to the national championship with a 38-24 win over Ohio State in the Louisiana Superdome on January 7. For the season, Flynn passed for over 2,400 yards and 21 touchdowns while completing over 56 percent of his passes. Against the Buckeyes Flynn completed 19-of-27 passes for 174 yards and four touchdowns. Texas State punter Chris MacDonald (Mesa, Ariz.) also is on the team, as are the Oklahoma trio of kicker Garrett Hartley (Southlake, Texas), tight end Joe Jon Finley (Arlington, Texas) and defensive back Marcus Walker (Waco, Texas). UCLA's Bruce Davis (Houston) and James McClinton (Garland, Texas) of Kansas---both defensive linemen---round out the Texas contingency. Other notable names for the West squad include Oklahoma State running back Dantrell Savage, San Diego State quarterback Kevin O'Connell, Nebraska quarterback Sam Keller and Hawai'I receiver Jason Rivers. The East team is heavy on ACC, SEC and Big Ten stars but does include a trio of Texans outside of Flynn. Navy fullback Adam Ballard (Lewisville, Texas), Army defensive back Caleb Campbell (Perryton, Texas) and Iowa defensive lineman Kenny Iwebema (Arlington, Texas) all hail from the Lone Star State. DALLAS, TEXAS (October 16, 2008) Sixteen years ago a fifteen year old English boy played his first ever soccer game in the USA, representing the Essex Schools select team at the famed Dallas Cup Youth International Soccer Tournament. Now he plays for the LA Galaxy on a five year, the highest ever, contract offered to a professional soccer player in the history of the game. His name is David Beckham. In a recent Sports Illustrated article he talks of his first visit to Dallas and how in the Dallas Cup HomeStay Program he stayed with an Hispanic family. He mentioned how welcoming and enjoyable they made his stay. He states that over the years he has attempted to trace that family without success. In the true Sherlock Holmes/Dr. Watson style, Randy Jones, Dallas Cup tournament manager and Gordon Jago, the executive director, set out to trace the "unknown family." Delving into past tournament records to trace the Dallas teams involved, numerous phone calls and "clever detective work", the case has been solved. The family has been traced and they still live here in the Dallas area. Now all that remains is for a meeting of the HomeStay family with David Beckham to be arranged when David next visits to play against FC Dallas. Another problem? Elementary, my dear Watson." DALLAS, TEXAS) (January 16, 2008) Dr Pepper Dallas Cup XXIX announces the Dr Pepper Opening Sunday game lineup, with local Dallas team, Andromeda SC competing against last year's Dallas Cup Super Group Champions, Sao Paulo FC of Brazil on March 16th for the 3:00 p.m. kick-off at Pizza Hut Park Stadium in Frisco. At 5:00 p.m., the 29th Annual Opening Day Ceremonies, an Olympic-style parade, will allow spectators to see all participating teams. The 7:00 p.m. match-up will feature Liverpool FC of England and Slavija FK of Bosnia/Herzegovina. Liverpool FC of England - popular British club owned by Dallas businessman Tom Hicks, Jr.
Benfica of Portugal - sponsored by adidas, returns to compete after a five year absence. With approximately 180 teams from around the United States and the world, ages under 13 to under 19, competing in this years' tournament March 16-23, the tournament will be another strong show for spectators to enjoy! "We are delighted that so many top boys youth teams from around the world of soccer, will be competing in our tournament next March, giving the players the very best competition and allow the Dallas soccer fans the opportunity to see the very best youth soccer and potential soccer stars of the future", Dallas Cup executive director, Gordon Jago stated. IRVING, TEXAS (January 15, 2008) Rice’s Pam Zelnick is the Conference USA Swimmer of the Week after winning the 100-yard breaststroke against No. 6 Texas A&M last weekend. The sophomore was also third in the 100-yard freestyle and competed on two Rice relays that claimed second and third place, respectively. SMU’s Britney Yancey is the Diver of the Week. Yancey won the three-meter board against No. 1 Auburn and No. 6 Texas A&M this past weekend, tallying 288.90 for her six dives. Zelnick won the 100-yard breaststroke in a non-conference dual meet against No. 6 Texas A&M Friday afternoon at Rice. Zelnick posted a winning time of 1:07.08 to top six competitors. She also was third in the 100-freestyle and competed on both the 200-free and 200-medley relays for Rice that claimed second and third place, respectively. The weekly award is the first of Zelnick’s career. Yancey won the three-meter board against No. 1 Auburn and No. 6 Texas A&M this past weekend, tallying 288.90 for her six dives. Her next nearest competitor was over 17 points behind her, as Yancey ran away with the event. In addition, she took fourth in the one-meter board, scoring 214.00, putting her ahead of Texas A&M’s Courtney Brown. This is Yancey’s first career weekly honor. Jones, Kinzback, Foster, Wilkinson, and Drew and Jessica Livingston dive for the Woodlands Diving Club, while Bounds dives for the Longhorn Diving Club in Austin. The FINA World Cup, an Olympic qualifying meet, will be held February 19-24 in Beijing. Competition will be conducted in four events for both men and women: 3-meter, 10-meter, synchronized 3-meter and synchronized 10-meter. The U.S. may enter two divers on each individual event and one team per synchronized event. The United States has already secured six out of a possible 12 Olympic spots and will be looking to fill its additional spots at the World Cup. The U.S. still needs to earn one individual spot for men’s 3-meter and women’s 10-meter, two individual spots for men’s 10-meter, and one spot each for both women’s synchronized diving events. The U.S. earned its other spots at the 2007 World Championships. USA Diving will use the World Cup selection camp to choose teams to compete at 2008 Grand Prix meets in China and Russia as well. HOUSTON, TEXAS (January 13, 2008) More than 20,000 participants, a race record, lined up on a weather-perfect morning for the 36th running of the Chevron Houston Marathon trio of races. Among the records set, Dire Tune obliterated her 2007 record by a staggering 2 minutes, 12 seconds for back-to-back victories in the marathon. Tune, 22, of Ethiopia set a course record 2:24:40, besting her 2007 record of 2:26:52. Worknesh Tola, 30, of Ethiopia, finished second in 2:35:37. In the men’s race, David Cheruiyot, the 2005 and 2006 marathon winner, returned to Houston to claim his third victory in four years. Cheruiyot, 37, of Kenya had a closer race, finishing in 2:12:32, just 13 seconds ahead of Kasime Adilo of Ethiopia. With his victory, Cheruiyot joins Stephen Ndungu as the second three-time winner of the Houston Marathon. In the Aramco Houston Half Marathon, which serves as the USA Half Marathon Championships, James Carney clocked a 1:02:21, eleven seconds ahead of Jason Lehmkuhle. Kate O’Neill, 27, broke the tape in 1:11:57, 13 seconds ahead of Desiree Davila. Tune, who hopes to make the 2008 Ethiopian Olympic team, said she expected to run a record time, but was concerned about the breezy conditions on an otherwise ideal day. For her victory, Tune pocketed $25,000 and an additional $10,000 for the record. O’Neill, of Palo Alto, California and Carney, 29, of Boulder, Colorado, fresh off his 2:16:54 showing at the U.S. Olympic Trial marathon in November, take home $12,000each in prize money. The races are expected to raise a record $1 million for 44 charities associated with the Houston Marathon Committee’s Run for a Reason charity program. The Chevron Houston Marathon, a Running USA founding member, is the nation’s premier winter marathon, annually attracting participants from all 50 U.S. states and nearly 30 foreign countries. In 2008, more than 23,000 runners took part in four marathon weekend events (marathon, half marathon, 5K and children’s run). The Chevron Houston Marathon offers the only closed marathon course in Texas and is ranked among the top five in the nation by the Ultimate Guide to Marathons for fastest course, organization and crowd support. More than 5,000 volunteers organize the race, which is Houston’s largest single-day sporting event. His time of 2:12.31 was faster than his victory in 2005 (2:14.50) but a mire 29 seconds slower than 2006 (2:12.02). He finished in fifth place in 2007 with the time of 2:15.55. Cheruiyot’s personal best time came at the 2007 Ottawa Marathon, where he ran 2:10.36. He had previously won the 2007 Istanbul Marathon with the time of 2:10.56. On the woman’s side, Ethiopia’s Dire Tune broke her own course record by more than two minutes in winning her division of the marathon. She destroyed the record of 2:26.52 by running 2:24.39. In the half-marathon, former Penn State and Millerville University runner James Carney was victorious with the time of 1:02.21. The race also served as the U.S.A. Track and Field national championship. On the woman’s side, 2004 Olympian Katie O’Neill ran 1:11.57 to take the title, a bit slower than her personal best of 1:11.47 at last year’s race. She finished in second place in that race, losing to Elva Dryer (2:10.42). Dryer did not finish in the top 25 in this year’s race. HOUSTON, TEXAS (January 11, 2008) The Chevron Houston Marathon will mark its 36th running with its biggest and best race ever this weekend, when more than 20,000 runners take to the streets of Houston in three events. The fastest runners will compete for a prize purse that tops $230,000. Registration for the Chevron Houston Marathon and Aramco Houston Half Marathon reached the combined field limit of 17,000 and closed in late September, a record 14 weeks prior to race day. Registration for the EP5K will be available at the Roger Clemens Institute EXPO at the George R. Brown Convention Center on Friday, Jan. 11 and Saturday, Jan. 12. The three races are scheduled for Sunday, Jan. 13. The Aramco Houston Half Marathon will host the USA Men’s Half Marathon Championship for the fourth consecutive year and the USA Women’s Half Marathon Championship for the second year in a row. Both races will bring in many of America’s top male and female distance runners, who will compete for $62,500 in prize money in the half marathon. The race will host the Championships through 2011. Houston Mayor Bill White will fire the starting gun to begin the marathon and half marathon at 7 a.m. The EP5K will get under way at 7:30 a.m.
Elite athletes won’t be the only winners in this year’s race. Record participation again this year is expected to generate $1 million through the race’s Run for a Reason charity program, which raises money for 44 different charities. Runners raised a record $852,000 in 2007. Runner packet pickup and on-site registration for the EP5K begins Friday at the Roger Clemens Institute EXPO. The EXPO, which includes more than 100 exhibitors and seminars on health, fitness and running, is open Friday, Jan. 11 from 11 a.m. to 6 p.m., and Saturday, Jan. 12, from 9 a.m. to 6 p.m. Staged in the George R. Brown Convention Center, Hall D, first level, the EXPO is free and open to the public. There is no runner packet pickup on race day. For the first time ever, the Chevron Houston Marathon and Aramco Houston Half Marathon will feature a wave start this year. The first wave will start at 7:00 a.m. and the second wave will start at 7:10 a.m. 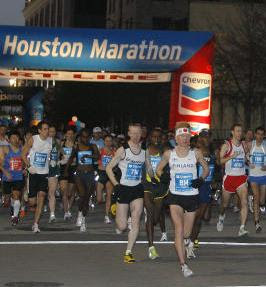 The Chevron Houston Marathon, a Running USA founding member, is the nation’s premier winter marathon, annually attracting participants from all 50 U.S. states and nearly 30 foreign countries. In 2007, more than 20,000 runners took part in four marathon weekend events (marathon, half marathon, 5K and children’s run). The Chevron Houston Marathon offers the only closed marathon course in Texas and is ranked among the top five in the nation by the Ultimate Guide to Marathons for fastest course, organization and crowd support. More than 5,000 volunteers organize the race, which is Houston’s largest single-day sporting event.